The race is held the last Saturday of June. The race includes a 1 mile fun run, a 5k and a10k. 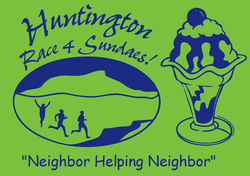 Prizes are awarded to top 2 finishers in various age groups for 5K & 10K -- all children running the 1-mile fun run recieve a medal of accomplishment and of course ALL runners get to make their own ice cream sundae!! !